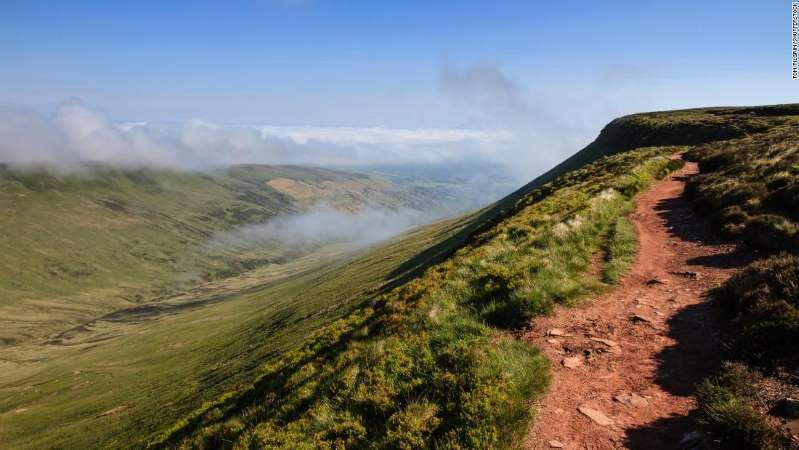 That's the distance that caused Fan y Big, a peak in the Brecon Beacons National Park in south Wales, to lose its status as a mountain. Now it's merely a hill. This popular hiking spot has long enjoyed a place on the list of Hewitts -- also known as mountains -- in England, Wales and Ireland. But Myrddyn Phillips, a mountain surveyor, used satellite technology to determine that Fan y Big's minimum drop was, well, below the minimum. It measured at 93.4 feet (28.5 meters). That's 5 feet (1.5 meters) shorter than what is required for mountain status, the park's Facebook page noted. "The technology is so accurate, it collects hundreds of data points to get a good average," Phillips told the BBC. "It's the same sort of technology used by GPS." "Although, on paper we may have lost a Beacon, we all know at Brecon Beacons National Park that Fan y Big will continue to be a mountain to be climbed, a peak to be reached and a summit worth seeing. "Let the satellites and figures show what they may, but underneath the starry night sky, the Fan y Big Beacon will continue to be a pinnacle at Wales' Best Destination."